It was a lemony sort of day . 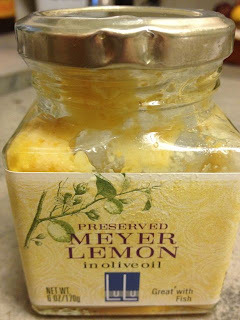 . .
and the preserved lemon was briney enough to be a good olive replacement. Lemons and olives and chickens and Moroccan seasonings. 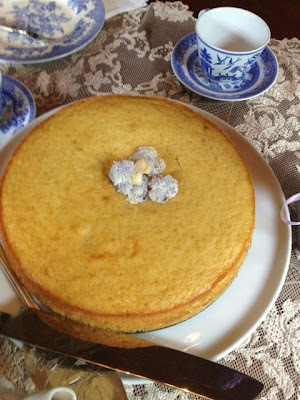 From Ina Garten -- so it isn't "authentic" but Ina's recipes are always good! In a large bowl, mix the garlic, cumin, ginger, paprika, salt and pepper, 1/2 c. grated onion and the oil. Rinse the preserved lemons and remove the pulp. RESERVE the lemon peel for late use. Add the lemon pulp to mixing bowl. Add the chicken. Mix everything together and place in a large plastic bag to marinate overnight in the refrigerator (24 hours really gives the chicken the best flavor). In a large Dutch oven, place the chicken and marinade; add the stems of the parsley and cilantro, the rest of the grated onion, the powdered saffron and 1 1/2 c. water. Bring to a boil over high heat, turn down to a simmer and cook, partially covered for 30 minutes. Remove the cover, stir the chicken and continue to simmer for another 15 minutes or until the chicken is tender. Remove the chicken to a serving dish and cover with foil to keep warm. Keep the sauce on stove and begin to reduce. Slice the preserved lemon peel into thin slices and add to the sauce along with the olives, parsley and cilantro. Reduce until the sauce is just a little thick. This shouldn't take more than 5 min at the most. Unocover the chicken and remove the skin from the chicken (It doesn't look pretty and who needs extra fat) Pour sauce over chicken and serve. which is truly one of our favorites. Not quite enough olive oil so regular olive oil was added to get the right amount. And a great tea cake for our afternoon nosh. preserved lemon in olive oil versus the "regular" way! One of my friends used lemon pepper in everything. So tiring that I ended up avoiding lemon pepper like the plague! but I did use it in the cake, the tajine, some steelhead trout I fixed earlier in the week. 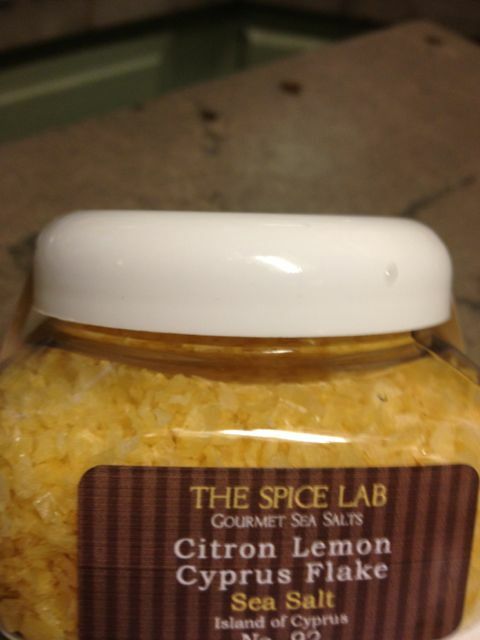 It's a great salt and definitely adds that "depth of flavor" that we are always looking for! It is Friday and I'm joining Michael at Rattlebridge Farm for Foodie Friday. Oh my goodness, but this looks wonderful! I love anything with a Moroccan taste, so will definitely try this. 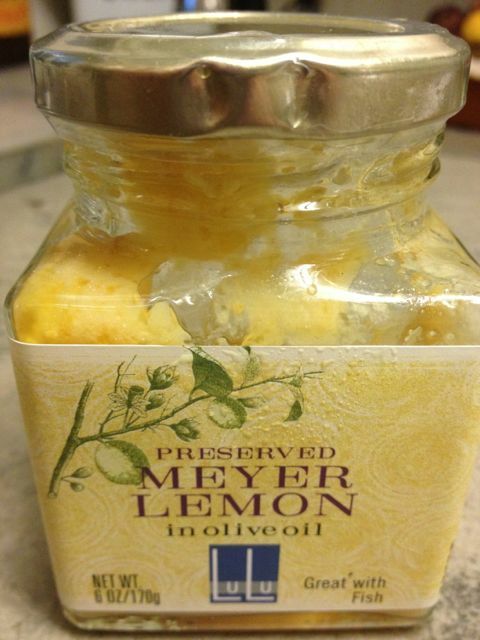 I wonder if it is possible to find Meyer Lemon preserved like that up here? If not, I'll add it to my growing shopping list for the next trip south of the border. oy, whatever you have on the bottom of your page with blogger makes my computer freeze, blogger hates explorer and makes my life miserable on purpose! anyway, i have no idea if this will post since its taken 6 tries to even get the comment box to open, but i enjoyed seeing your use of the mlw goodie box. your chicken sounds divine, mary made something similar and who doesn't like starting with cocktails and ending with dessert! Wonderful post, Martha. 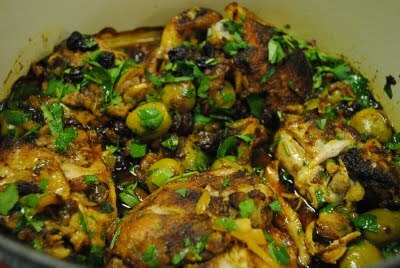 Chicken, lemons and olives are such a great flavor combination. 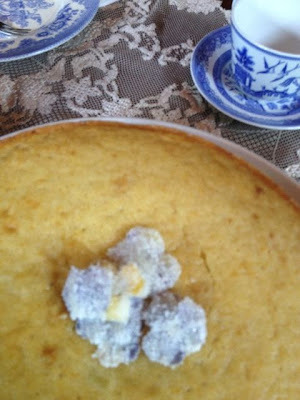 I'm looking forward to trying a cake with lemons and olive oil. 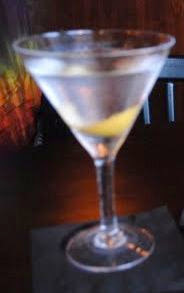 A slice of lemon in a martini was a grand way to start the evening. Martha, sorry to be late to your beautiful meal. My sister came to visit and cut my computer time short. But here I am, so thanks for saving me a place. Everything looks delicious. We will try the Moroccan chicken. I, too, made an olive oil cake. They are delicious! I didn't use the lemons in the oil, just the oil mixed with regular as you did. I'm making another and will use the lemons in the oil. Wonderful idea! Thanks for sharing the inspiration.